Hello, I have yet again failed an intro. Anyways. One Year Adventure Novel, if you hadn’t figured it out from the intro and the title. I’m about 8 chapters into a 12 chapter novel. I might post an update when I finish, but I doubt anything will drastically change. It was time for a review. Exiles Blog Tour and Author Interview!!! Guys, it’s here! It’s here! I’ve been a die-hard fan of the Ilyon Chronicles and I was so excited to participate in Jaye L. Knight’s newest novel’s blog tour! This is the fourth book in her Christian fantasy series, Ilyon Chronicles. I reviewed the first book here a while back, so if you don’t know anything about it, check it out. The first three Kindle books are on sale August 11th – 14th! You can find them on Amazon. You can even snag the first book for .99 cents!!! But this was the first book I read during my summer break. I was super excited for the book when I first heard of it, because I thought it sounded amazing and the cover art is gorgeous! The premise was super cool, and I went into this book with high expectations. That’s dangerous for me because I rarely have high expectations for books. If I have high expectations, they’re more likely than not to get dashed. If I don’t have high expectations and the book is good, I’ll be pleasantly surprised, but if it’s not, I don’t suffer any loss. 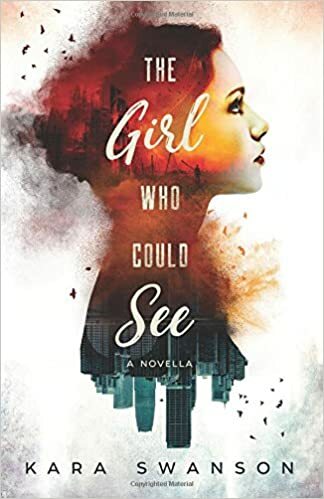 But The Girl Who Could See, by Kara Swanson, met all those expectations. “All her life Fern has been told she is blind to reality—but what if she is the only one who can truly see? I was really interested because the book revolved around schizophrenia and imaginary friends, both of which I thought would be good in a book. Really, it’s a novella, but it was the perfect length for me. Any longer and it would have felt way too long. Fern (aka Plant Girl): Fern is a strong heroine who just wants to take care of her niece. Doing so means that she needs to keep her job. It’s easier said than done. She’s lost two jobs in the past two months because of accidents related to her schizophrenia. In fact, her illness is so bad that she had to drop out of high school. Even before that, her parents were a part of a drug dealership, and often had the children pedal the drugs for them. Despite it all, she’s a determined girl.